I wish I could tell you all about the ins and outs of the plot of The Prestige, but I won’t for two reasons: 1) I want you to experience this for yourself, and 2) There is so much here to explain that we would be here all day. 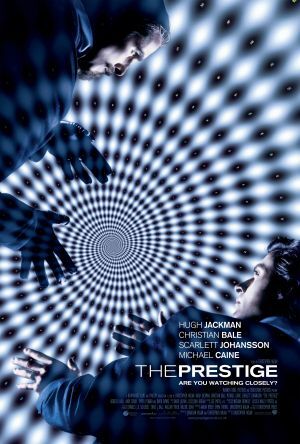 Instead I will simply point out that The Prestige is brilliant, engaging, and multilayered to a wondrous extent. While the story to tell is sometimes condensed to the 130 minute runtime to the point of being a bit muddled, and the ending verges on the ridiculous, enough excellent work is on display here to make this a highly recommendable and likable thriller. Set at the turn of the century, we are introduced to Robert Angier (HUGH JACKMAN) and Alfred Borden (CHRISTIAN BALE), two stooges for Milton the Magician (RICKY JAY). They are employed to sit in at every show, and be the “volunteers” picked for a particular illusion, which involves tying up one of Milton’s assistants and throwing her in a tank of water. Once onstage, they tie the ropes in such a way that they are easily escapable. One night, something goes wrong, and she drowns in the tank of water, unable to free herself from the ropes. It is known that Borden was talking about tying the ropes in a different way. After this incident, Angier despises Borden. They leave Milton and become rival magicians in their own right. Angier repeatedly works with stage manager John Cutter (MICHAEL CAINE). What follows is a story full of supreme magician one-upsmanship, each observing (and Borden occasionally sabotaging) their opponent’s shows. It’s all very fascinating, as the screenplay, based on a novel by Christopher Priest, twists and turns, keeping a fair deal of intrigue throughout the picture. Yes, twists and turns. Make no mistake, the last half hour of The Prestige is loaded with plot twists, as the movie that begins in a nonlinear style slowly comes together and you understand the significance of the images shown at the start. Acting-wise, we’ve come to expect no less than the best from names like Hugh Jackman, Christian Bale, and Michael Caine. They certainly deliver here, with full fleshed and deep deliveries. Also good is Scarlet Johansson as Angier’s partner (domestic & professional), a character who becomes more complex than first thought. Visually, this movie is magnificent. Wally Pfister is a truly gifted cinematographer, and each shot is filled and framed deliberately and solidly. The production and costume design is appealing and atmospheric. The effects are spectacular, particularly displays of the big bright creations of Nikola Tesla (DAVID BOWIE, in a good dramatic showing), his namesake coils in all of their bright, zapping, AC glory, employed for use by Angier during a climactic illusion. I did, however, have one fairly-sized problem with The Prestige, and that is how what could have been one of the greatest third acts of recent memory has its brilliance riddled with rushed, muddy points and an ending with a few too many cop out qualities. I wish I could be more specific, but then the spoilers would flow freely, and the few readers that haven’t already fallen asleep from boredom would write irate comments. Suffice it to say a neater and more precise manner would have helped my view immensely. Still, there is far too much greatness otherwise to let that gripe lessen the overall point of this review: The Prestige is a major studio film of high intelligence, with classic direction from Christopher Nolan, a mostly well crafted script, and finely tuned performances from all major players.